An interfaith group of caring professionals in Altrincham, Cheshire UK are organising a charity fund raising event towards the end of August. I highly recommend readers to join the event by being there if you can or by donating from a distance. They have a Facebook group for the event and are in the process of setting up on-line purchase of tickets and donations for those who might like to contribute remotely. The event is being supported by International Foundation for Mother and Child Health (IFMCH) an international charity set up to improve life expectancy among mothers and young children in Pakistan. At the beginning of military action in Swat when the relief effort to help the internally displaced people (IDP)s from Swat region was not very organised Dr. Nazir Ahmad a close friend of mine and a very well respected Cheshire psychiatrist personally raised over 2500 pounds and disbursed these funds among the IDPs that were not the radar of relief agencies for not being in the government established camps. Dr Nazir Ahmad is advising this interfaith group on disbursing proceeds from the Iftar charity event without wasting any money on running costs that accompany big charities. I am writing this post as an invite to all concerned and caring citizens to come forward and join in person, on-line, or in at least in your prayers. 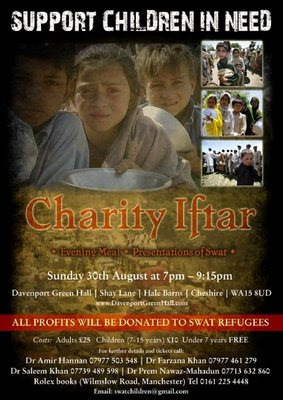 Lets not forget the plight of the IDPs, children and mothers in Swat, they need our help now more than ever.